Z.S. 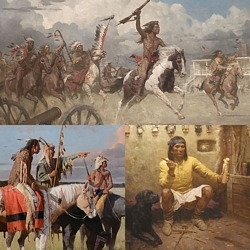 Liang continues to be one of the most important artists painting the history of the American West today. His track record of sold out original shows and Fine Art Editions attest to the regard for the painter and the perception of the potential for his work tomorrow. He has a particular knack for portraying intimate details of Native American life, even when his canvases are epic in scale.